From the micro to the macro in terms of expirations, we are faced with the one termination with which we are all too familiar� the up-close-and-personal end of life for each of us and for the ones we love. It�s the personal that terrifies us most because it feels the most real. Nancy Kilpatrick has gathered together twenty-five original stories by Kelley Armstrong; Nancy Holder & Erin Underwood; Steve Rasnic Tem and Melanie Tem; Lois H. Gresh; Gar and Judy Reeves-Stevens; Daniel Sernine; Paul Kane; S�phera Gir�n; Kathryn Ptacek; Steve Vernon; Rebecca Bradley; Mary E. Choo; Morgan Dambergs; Tobin Elliott; Pat Flewwelling; J. M. Frey; Ken Goldman; Amy Grech; David McDonald; Ryan McFadden; Silvia Moreno-Garcia; Elaine Pascale; Richard Payne; Christine Steendam; and George Wilhite to look at the what-if�s of our expiring future. 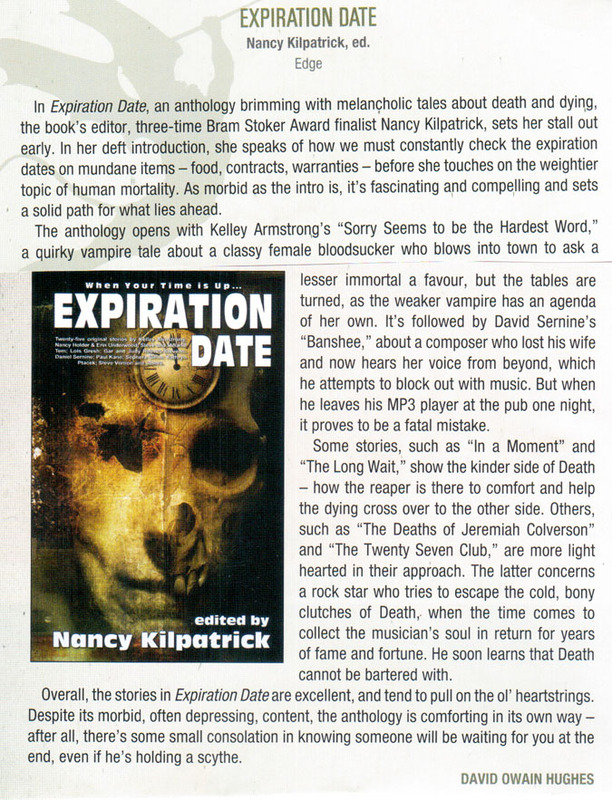 Award-winning author Nancy Kilpatrick has published 18 novels, over 225 short stories, 1 non-fiction book (The Goth Bible) and has edited 15 anthologies. She writes mainly dark fantasy, horror, mysteries and erotica, and is currently working on two new novels. Some of her recent short fiction appears in: Blood Lite and Blood Lite 2; Hellbound Hearts; The Bleeding Edge; The Living Dead; Vampire Stories by Women; The Mammoth Book of Ghost Stories by Women;� Vampires: Dracula and the Undead Legions; By Blood We Live; The Bitten Word;� Halloween:�Magic, Mystery and the Macabre; Searchers After Horror; Dark Fusion: Where Monsters Lurk; and Darkness on the Edge. She co-edited with David Morrell the horror/dark fantasy anthology Tesseracts Thirteen. She is the editor of Evolve: Vampire Stories of the New Undead, Evolve Two: Vampire Stories of the Future Undead, and Danse Macabre: Close Encounters with the Reaper.